The Arab American Cultural Center promotes the social and academic well-being of Arab American students, staff, and faculty. It seeks to enhance cultural awareness, facilitate dialogue, and foster interaction among the diverse groups at UIC. Through an array of cultural and educational programs, the Arab American Cultural Center sustains an inclusive campus community where human differences are embraced. The Center is also a resource for students, staff, and faculty desiring engagement with Chicago’s Arab American communities and organizations. The Asian American Resource and Cultural Center (AARCC) offers social, cultural, and educational programs that promote knowledge of and foster engagement with issues related to Asian Americans and Asian American studies. Their co-curricular programs and collaborations with other campus units ensure that the needs of Asian American students are met. AARCC also serves as a resource for the campus to engage with Chicago’s Asian American communities and organizations. The Disability Resource Center (DRC) provides services to undergraduate and graduate students with diverse disabilities to ensure equal access on campus in accordance with State and Federal Law so that they may fully participate in campus life. The DRC collaborates with various academic units in order to provide services including, but not limited to, academic accommodations, access to classrooms, housing, recreation programs, and parking services. The DRC is also committed to working with community organizations to promote disability arts and culture. The Gender and Sexuality Center (GSC) facilitates educational and cultural programs related to lesbian, gay, bisexual, transgender, queer, and allied (LGBTQA) people and issues. The GSC hosts events throughout the year including the Rainbow Social, heritage programs, and Lavender Graduation. The GSC also provides Safe Zone training to campus and community members. The GSC’s work, in collaboration with many other campus units, has resulted in UIC being recently named one of the Top 25 LGBTQ-friendliest campuses in the country. The Latino Cultural Center (LCC) works to expand the understanding of Latino cultures as well as to ensure that Latino/a students have a positive self-defined identity. 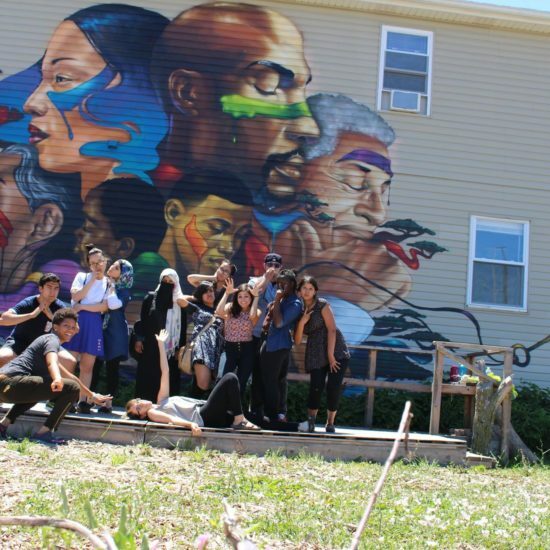 The LCC also provides students with practical tools to help them graduate, join the workforce, and become the next generation of leaders, through cultural and artistic programs, intercultural dialogues, and educational workshops. 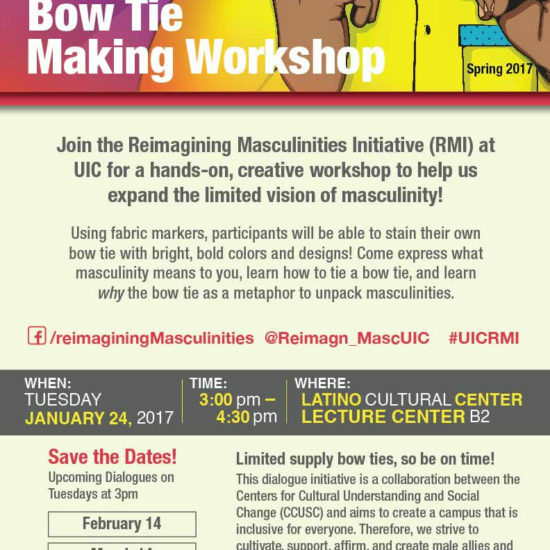 The LCC collaborates with other units on campus and community organizations to improve the lives of Latinos at UIC and in local communities. The Women’s Leadership and Resource Center (WLRC) facilitates women’s advancement, growth, and development through programming, advocacy, policy development, and institutional interventions. WLRC also oversees the Campus Advocacy Network (CAN) that provides advocacy for UIC students, staff, and faculty who are victims of sexual assault, domestic violence, stalking, and hate crimes. WLRC/CAN collaborates with various campus units and advises several student groups, including Men Against Sexual Violence and UIC Pride, among others. The UIC Heritage Garden is a hands-on learning project with an internship program. 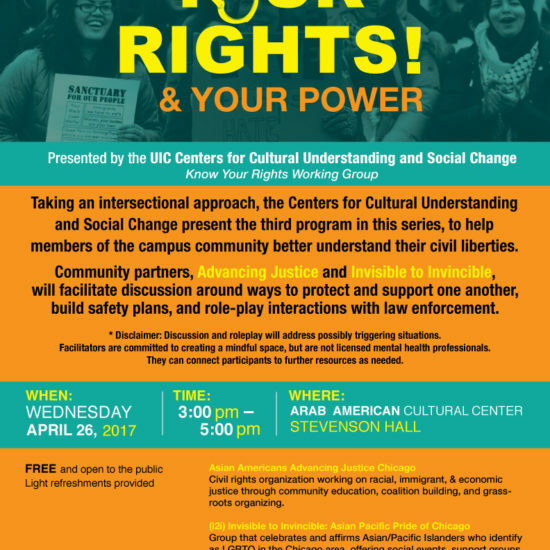 The Centers for Cultural Understanding and Social Change hosted three panel conversations with a diverse group of speakers in order to better understand the idea of knowing your rights.